Lateral Ankle Sprain | WILL I EVER DANCE AGAIN? An ankle ligament sprain involves damage to one or more of the outside ligaments that support the ankle joint. 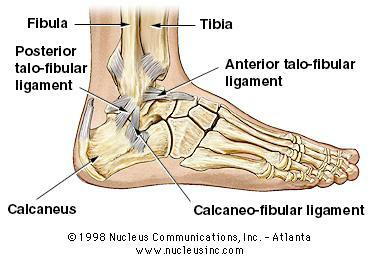 Ligaments provide the ankle joint with stability by attaching from one bone to another. If these ligaments ever become over-stretched (usually during a trauma), it results in a complete or partial tear of the ligament fibres. Causes Of A Ligaments Sprain? Ligament sprains are an acute injury and are usually caused by trauma. There will an incident where the ankle either rolls in or out without control and pain will result. It is more commonly seen with dance with landing from jumps and leaps or rolling off demi point. 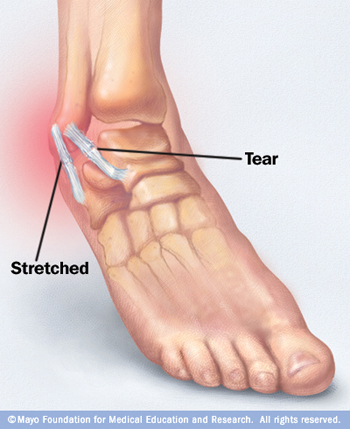 Additionally, if you have high-arched or flat feet, you may be more susceptible to an ankle ligament sprain. People, who have sustained an ankle ligament injury in the past, can be more likely to re-sprain the same ankle again particularly if their management and rehabilitation was insufficient. A diagnosis will then need to be made by a physiotherapist to determine the nature of the sprain and the course of action required for rehab. Recovery will be dependent upon the nature of the sprain. Full recovery will take about 12 weeks although full activity will normally be possible prior to this time. It is important to continue rehab through to the end even if feeling good, as it is common to re sprain the area again if full balance training had not been completed. Rehab will include ankle strength, hip strength and balance exercises.